Bohemian Rhapsody just picked up two Golden Globe nominations, and its success is unlikely to stop there. Rami Malek (Night at the Museum films, Papillon 2017, Mr. Robot TV series), who plays rock icon Freddie Mercury, turns in a nomination-worthy performance, and the movie is strong with subtle themes not necessarily appreciated when it was released in the U.S. in early November. The movie, which scored a best film nomination as well, is really the story of how the band gave life and meaning to one of the 21st century’s most iconic rock performers and the role audiences played in keeping the band fresh and successful. To be sure, Mercury’s awe-inspiring talent, charisma, and theatrics overshadowed Queen’s other three members. But director Bryan Singer (The Usual Suspects, X-Men, Valkyrie) and screenwriter Anthony McCarten (The Theory of Everything, Darkest Hour) have weaved together a complex tale on film that ensnares audiences in Mercury’s life while drawing out the group dynamic that made Queen so successful. More subtly, the movie represents an important nod to the virtues of commercial music, and the validation artists receive when they connect directly with their audiences. The movie picks up with Mercury following the band Smile, a precursor to Queen. 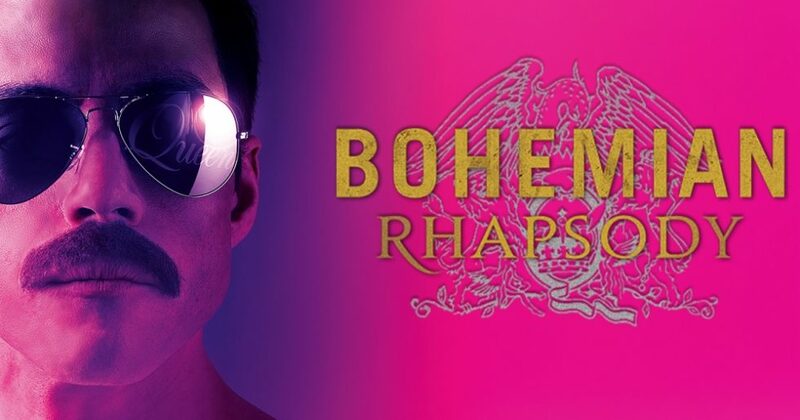 When the band’s lead singer quits, looking for a more successful gig, Mercury wins over the remaining band members–guitarist Brian May (Gwilym Lee, The Tourist, Jamestown, Midsomer Murders) and drummer Roger Taylor (Ben Hardy, X-Men: Apocalypse, BBC’s East Enders)—with his vocal talent. Mercury doesn’t, however, win over his conservative Indian father, who wants him to get a traditional job that earns a steady income. Freddie, as Queen fans may recall, was born Farrokh Bulsara in a family with ethnic Persian and Indian roots. He grew up in India and Tanzania before his family moved to England when Mercury was 17. Mercury showed musical talent early, and his family sent him to boarding school near Mumbai, where he studied piano and listened, and learned, rock and roll. He attended university in England and held odd jobs, including one as an airport baggage handler, before landing the job as Queen’s lead singer and frontman. The film, however, doesn’t dwell on this personal back story. Rather, it launches full throttle into how Mercury’s aggressive and often times overbearing personality transforms Smile into Queen with the addition of bass player John Deacon (Joe Mazzello, Jurassic Park, HBO’s The Pacific, The Social Network). The record companies were skeptical of the music and the name. But Mercury and the band used their live performances to build a fan base that gives them leverage with conservative company executives. Mercury’s personality butts heads with the executives, but he prevails, as does Queen. While Mercury’s position as one of the 20th century’s most talented vocalists and performers is undisputed, the movie does a remarkable job of showing how all four members were critical to its success. Mercury’s songwriting talent and stage charisma make it easy to forget that Brian May wrote “We Will Rock You” and “Fat Bottomed Girls” and bassist John Deacon wrote “Another One Bites the Dust” and “You’re My Best Friend”. Roger Taylor was a major contributor to Queen’s sound and music. Seven of the ten songs included on Queen’s Greatest Hits were written by someone other than Mercury. Understanding the relative contributions of each member of the band is a critical dynamic that holds the story of Queen together in real life as well as in Bohemian Rhapsody. Mercury admits the only time he feels he is himself is when he is performing on stage. On stage, Mercury is bodacious and confident in his music, a charismatic ground performer who electrifies the audience by pulling them into the music. Offstage, he is insecure and lost, susceptible to sycophants who see him as their ticket to personal wealth. These personal insecurities come through exceptionally well in the film. The ebb and flow of Mercury’s moods and this relationship with his bandmates keep the film moving forward on a pace that keeps audiences engaged throughout. The connection to audiences through live performance is often better understood at times by the band than Mercury even though it’s central to Queen’s commercial success and artistic innovation. Ultimately, the story of the band, and Mercury’s search for his own identity, gives meaning to Mercury’s life professionally and personally. Appropriately, the audience also becomes a vehicle for Mercury’s redemption in Bohemian Rhapsody. The movie deals heavily with Mercury’s bisexuality as a source of his insecurity and conflicted loyalties. Living in a time when homosexuality was taboo and terms such as “bisexuality” and “transgender” had yet to enter the mainstream, Mercury’s cloistered life prevented him from fully exploring his identity and limited his ability to form close, authentic relationships. Ironically, his closest friend is Mary Austin (Lucy Boynton, Murder on the Orient Express, Apostle), a woman he almost married and remained close friends with until his death from complications from HIV at the age of 45 in 1991. She’s the one that keeps him grounded, in real life as well as the film, even though his confusion over his own bisexuality ends their romance.